This year — skip the expensive dinner, and store bought cards, candy, giant stuffed teddy bear, and standard flower arrangements, for something much more special, unique, and good for your wallet and the environment. This February 14, my plan is to buy some ingredients from the local market and cook a nice dinner at home with my boyfriend. For his presents, I purchased a shea butter bar from Lush and a book from Powell’s. We’re keeping it cozy and will be doing our good deed for the day by babysitting his brother’s adorable one year old daughter while her parents go out for a much-needed date night. For you though, the possibilities are endless! Make one yourself! Not only is it more eco-friendly, cheaper, and more fun than buying a $5 card, but there’s no better way to communicate exactly how you feel or what you want to say, than by making a card to your personal requirements and specifications. Don’t know where to start? Grab a few magazines (and/or old cards, newspaper, photos, stickers, etc. ), a pair of scissors, tape and/or glue, and some paper or cardboard from the recycling bin, and get to work! I generally begin without a set idea or direction in mind, and then cut out anything that feels “right” or makes me think of the person (or an inside joke, shared memory) for whom I’m making the card. After I’ve compiled a decent set of pictures, photos, words, and/or stickers, I start playing around with them on the paper. Keep an open mind, and you’ll see that a theme starts to emerge, and at this point you should start to get pretty excited thinking about the person’s reaction when they read it. From there, finish it up by using a pen/glitter pen/paint/marker/crayon to complete the sentiment, and put it away somewhere safe to dry. I can almost guarantee-or-your-money-back, that the individual receiving your homemade art, will treasure and remember it for years to come. Put together your own succulent or potted plant arrangement. I personally love succulents because they’re incredibly easy to keep alive — infrequently (minimum every two weeks) pour a tiny bit of water into the soil and keep it near a light source — but they’re also more eco-friendly than buying flowers that are going to shrivel and die within a few days. Unlike stemmed roses, a cactus lasts, my friends. As an added bonus, cacti are, for some unknown reason (maybe because they’re Millennial-friendly and low maintenance) very trendy at the moment, and oh-so-Instagram-worthy. Start by first looking around your house for a container. Mason jars are super cute, but even other old jars or containers can be used as-is or, if you’re feeling extra-crafty, you can paint or decoupage the outside for some added oomph and personalization. 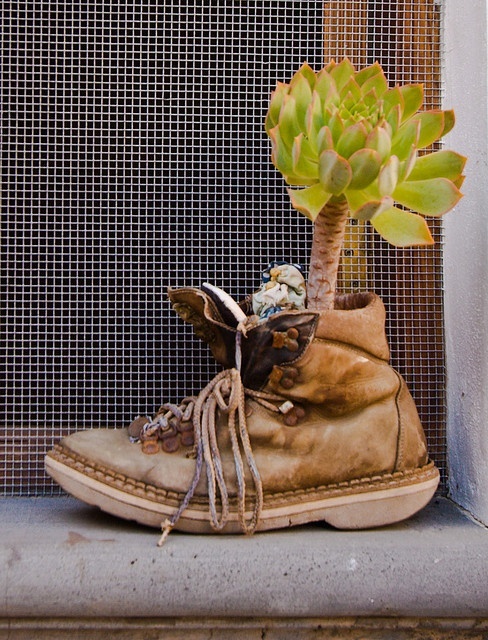 I’ve even seen plants potted in old shoes, so, really, the sky is the limit with the container you could use. Let your imagination run wild, and make it special for the recipient. Next, head to a plant nursery to pick up your new green friend. Avoid the plant departments of Wal-Mart, Lowe’s, and Home Depot, and instead opt for a locally owned store. A quick duckduckgo.com search should turn up some viable options. Before you leave for the store, make sure you have your container AKA the plant baby’s new home, with you. This really helps with picking out the right size plant since you need to ensure there’s sufficient room for the plant’s roots to grow and expand. If you need help, the folks at the nursery will be more than eager to assist you in selecting the best plant for your container and the recipient’s lifestyle. At this point, all that’s left is to remove your plant from the plastic container it arrived in and repot it in the container you prepared. As a finishing touch, you could create your own instruction care card and tie it around the container with a ribbon, piece of twine, string, etc. that you have lying around the house. Then, just be sure to keep it alive until you give it away to its new owner! Make your own chocolate-dipped strawberries or truffles! There are a million and two recipes out there for both, and trust me, they’re much easier to make than we’re lead to believe. You can also customize them based on the recipient’s taste preferences, and get really creative with the box in which you give them. Find a recipe. A quick duckduckgo.com search will yield myriad results. Head to your local shop to pick up the ingredients. The standard required items will most likely be baking chocolate, flavoring (e.g., vanilla extract), and, if you’re planning on making dipped items, the fruit, pretzel, bacon, etc. For those who have yet to venture into the kitchen, rest assured that there are plenty of cooking shows out there that will guide you every step of the way. Let them cool for a sufficient time as directed in the recipe. I would even recommend letting them sit overnight to ensure completeness. Find your box. It could be an old jewelry box, cardboard box that you decorate, vintage container/cigarette box, etc. Again, let your imagination run wild. What are your plans for Valentine’s Day? I would love to hear about what you did to celebrate the non-corporate way!